9 year old Katie Deakins shows amazing calmness in the face of serious injuries. 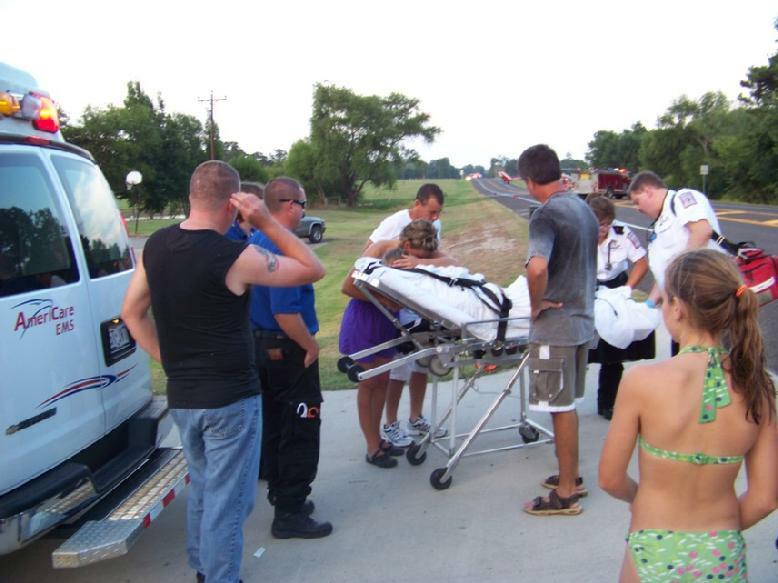 9 Year Old Girl Life Flighted From Tubing Accident, BLANCHARD, July 19, 2008 - At approximately 7:05 pm on July 19, 2008 a tubing accident on Lake Livingston caused a 9 year old girl to be life-flighted to Hermann Hospital in Houston. Katie Deakins was tubing with friends when the rope and hook that the rope connects to got wrapped around Deakins' upper right thigh. According to witnesses, the rope and hook cut deep into her leg. Greg Gilmore and his wife Karen and daughter Elise were nearby when they heard screaming coming from Katie and were able to get to her help and pull her from the water and managed to get Deakin ashore. Americare Ambulance service was summoned to the scene of the accident. Katie Deakin showed amazing calmness and composure in the face of serious injuries while EMS personnel tended to her. Her parents (Jim and LaDonna Deakin) were present while Katie was being worked on. Also assisting at the scene were DPS Troopers Sam Lattner and Thomas Micholac and Polk County Sheriff Deputy Jim Bowie. 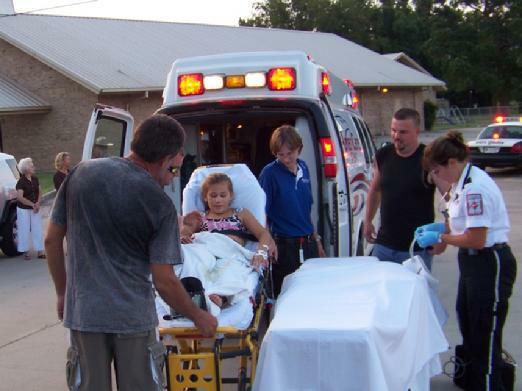 Life Flight was summoned to Blanchard Baptist Church where Katie and EMS personnel were located. Scenic Loop Volunteer Fire Department blocked 2457 while life flight was landed in the road. At time of press, the status of Katie Deakin is not yet known to PolkCountyToday.com. Katie's mother, LaDonna, hugs Katie just before her daughter is flown out. Video report with interview with rescuers.